How do you turn an ugly duckling into a head turner? Just scrape, sand, and paint. No rocket science required. Just lots of healthy elbow grease. Now that I'm almost done, I have been looking through the pictures I've taken the last week or so, and find they make an interesting progression. Hope you agree. 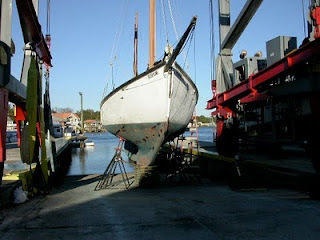 Photo 1 shows the Blue Moon freshly hauled. I think she's still dripping. 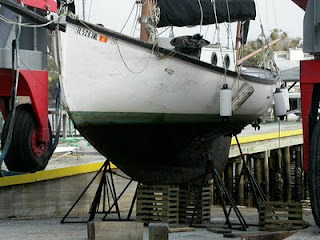 Her bottom is covered with oysters, barnacles, and a thick, sticky goo. Nasty stuff. Here's a close up of the bottom. My dinky Home Depot power washer didn't make a dent on this sort of junk. 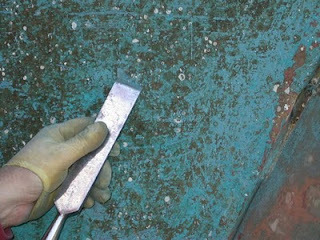 It's possible to scrape or wire brush this stuff off. Bob and I went at it with such tools for a couple hours. It probably would have take 2 days to get all the junk off. We eventually gave up and rented a heavy duty power washer. The kind with a big gas engine and a jet that will take your foot off if you aren't careful. That was the right tool for the job. Power washing the junk off revealed the bottom, which had other problems. 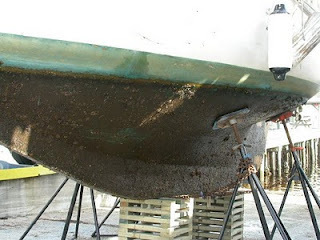 One of the most difficult problems was how to remove the barnacle 'feet'... these are little shell-like objects that stick to the hull like crazy. You'd think they were epoxied on if you didn't know better. The power washer didn't take them off. You could sand them off with a power sander, but that was like using a bulldozer to plant a petunia. It worked, but removed too much paint and/or wood surrounding the foot. After experimenting with several tools, I discovered a broad, sharp chisel took the feet off quickly and without damaging anything else. I'm sure it needs sharpening, after such abuse, but that's not a problem. 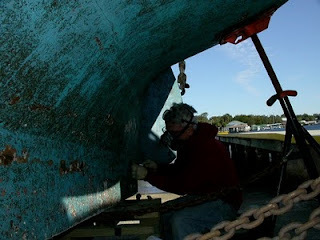 Eventually, the topsides and bottom needed a good sanding, mainly to fair out the uneven paint, as much as possible. A purist might have removed all the paint. I'm not a purist! After sanding and removing the bad wood around worm holes, we epoxied the holes. And sanded again. 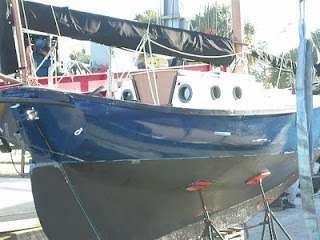 After the first coat of bottom and topside paint, she's starting to look good. 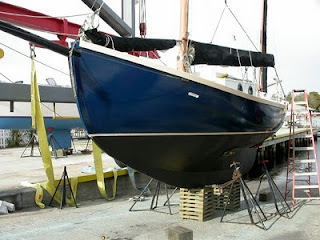 And here she is with a second coat top and bottom, rail painted a nice cream color, with a matching waterline. Whew! And that's how I spent my winter vacation! Launching tomorrow! Your paint job looks great! Did you spray or roll and tip? I just used a roller & paint brush. 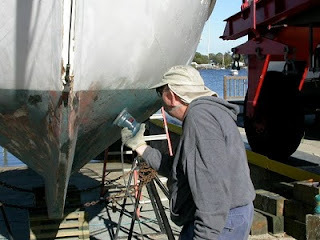 Would like a further description of the way you painted the topside.....preparation, how you painted, what kind of paint. I look forward to your blog each time. Good job John, shes looking the real deal now. love your blog. By the way, you do realize that you are going to have to continue with a lot more projects so you can keep all the followers happy for months/years to come. More details on how I painted: seriously, I just used a good quality brush to cut in around the edges, and then rolled the paint on with a normal roller. I don't know if this is the right way to do it, but it was the only way I knew how. Basically, the same as you would paint a room in your house. 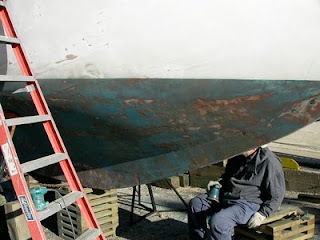 For paint, I used two coats of Interlux Brightside for the topsides, and three coats Micron CSC for the bottom. For the water line, I double-taped the line in, pressing the tape down as hard as possible to try to prevent bleed through under the tape. Then I used a brush to paint two coats. After waiting 2 days for the line to dry, I removed the tape. For the most part, the tape came off cleanly, but the topside paint did come off in a few small patches, and the cream paint did seep under the tape in a few places. I just touched up the top and bottom paint by hand with a brush. So, pretty simple, really. The Brightside paint is pretty forgiving and dries to a very hard finish. I like it a lot, so far. Blue Moon sure has some beautiful curves. Great blog too. Bill, that's a pretty cool trick that sounds like it would actually work. I've got to clean BM's bottom this spring. It's just kinda slimy, but I'll try your idea if I find anything worse.